Essential oils contain the life essence of plants, and you can make them at home. 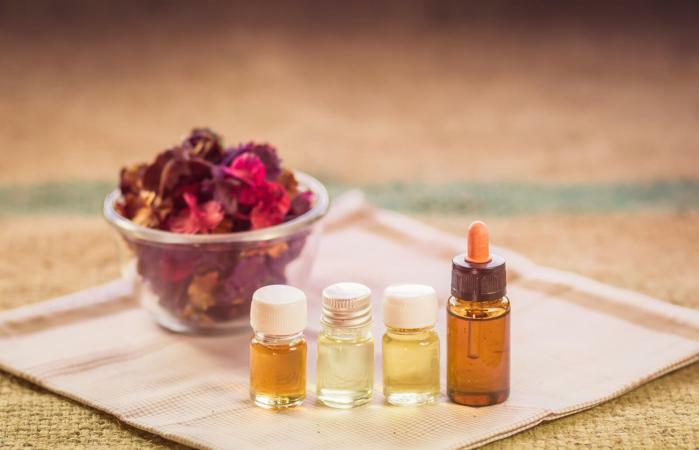 Making essential oils at home varies from simple to complex and can take anywhere from a few hours to weeks depending on the method you choose. The results vary from a dilute plant essences in a carrier oil to extremely pure essential oils. There are five methods for making essential oils at home depending on the equipment you have available, the end product you'd like, and how much time you wish to spend. The vodka and home distillation methods are the most complex, but they generate a pure essential oil using solvents and distillation. The other methods distill the plants' essence, but the end result are essential oils diluted by carrier oils. The ratio for using fresh flowers or herbs is one cup of carrier oil to 1/4 cup of flowers, leaves or other plant materials. If you are using fresh flowers or herbs, place them in a plastic bag and gently hit them with the wooden mallet and gently bruise the plant matter before making them into oils. How you make the oils depends on the method you choose, but there are some basic steps across all of the easy methods. Each of these methods require no specialized equipment, but the results aren't pure essential oils, rather they are plant essences in a carrier oil. Choose the method (below) to make your essential oil and follow it. Strain the mixture. Using unbleached cheesecloth, muslin, or gauze, strain the mixture into a dark colored glass storage jar or bottle. Discard the materials and keep the oil. Store the essential oil in a place that is cool, dark and dry. Most homemade essential oils have a shelf life of six to nine months depending on the specific blends. This method is easy and requires little hands on work after you've measured your raw materials. It takes about eight hours and the result is a dilute essential oil in which the plant essences have been infused into the carrier oil. Place the oil and the herbs in a small slow cooker. Turn the slow cooker on its keep warm setting, approximately 140 degrees Fahrenheit. Cover and let simmer for six to eight hours. This method is almost as easy as the slow cooker, although having your oven on does require some supervision so you will need to be home while the oil is extracted. It takes just a few hours, and the result is similar to the slow cooker with plant essences diluted by a carrier oil. Preheat your oven to 150 degrees Fahrenheit. Place the oils and herbs in a baking dish. Place in the oven for two hours. No time to supervise and no equipment? No worries! Try the sunlight method of oil extraction. This takes the longest (about two weeks), but it is easy to do and results in plant essences diluted by a carrier oil. Place the oils and the herbs in a mason jar and seal the jar with a rubber ring - a metal ring will contaminate the oil. Place the closed jar in full sunlight for a minimum of 14 days. The solvent and distillation methods are complex, involved, require specialized equipment, take longer amounts of time, and require large amounts of plant materials. However, the result is a pure essential oil similar to what you can buy from manufacturers. You can extract essential oils using a complex process using vodka as a solvent to extract the plant essence from the raw materials. This takes several weeks, plenty of equipment, and a large amount of raw materials, but the end result is a very pure form of essential oil without dilution. The process is outlined in the video below. You can also make essential oils using a homemade oil distiller to extract the oils from the plant material. It is a complex and lengthy process, but the result is pure essential oils with no dilution. Always start with very clean equipment; clean and sterilize jars, slow cooker crocks, etc. You can sterilize in the dishwasher. Although it probably seems like making large batches would be easier, it's best to make these in small batches since essential oils have a relatively short shelf life. Use the purest materials available; try to find organic herbs and oils to make the purest essential oils. You can use a funnel to pour your oils into one-ounce dropper bottles for easy application. Always wear gloves when handling or blending pure essential oils and keep the undiluted oils from coming into contact with your skin; direct contact may cause sensitization reactions. Dilute your essential oils before using them. A good rule of thumb is 2 drops of pure essential oil for one teaspoon of a carrier oil. Observe basic safety rules, such as never ingesting an essential oil. Your essential oils are flammable, so keep them away from open flame or other heat sources. You can grow your own organic flowers and herbs, or you can find high quality dried herbs and flowers online. Mountain Rose Herbs has an astonishing array of herbs and plant materials for making essential oils that are organic and sustainably sourced. Bulk apothecary offers wholesale raw materials and packaging supplies. If you plan to distill your own oils at home, consider purchasing a home distiller that is pre-made. It is costly, but it's a good investment if you discover you prefer to make your own pure oils. AromaTools has bottles and dispensers for sale for your homemade essential oils. Although there are more than 700 types of aromatic plants used to make essential oils today, only about 40 of them are commonly used. There are also countless combinations of various blends of flowers, herbs, and spices. There are several processing methods that are simple, fun, and produce wonderfully scented oils to create harmony and balance in your home. Once you learn how to make essential oils, you will find yourself enjoying the process and benefitting from the results.